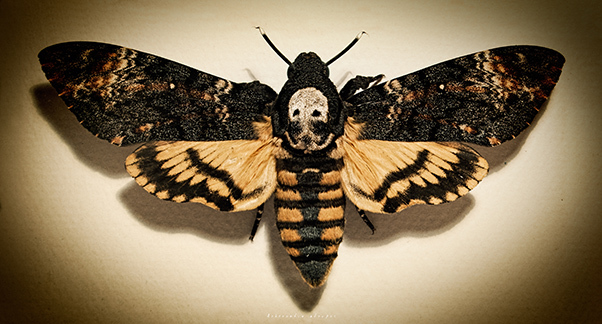 Acherontia atropos, Death’s Head Hawk Moth. The moth of the Silence of the Lambs. I will tell you its story some other day (click to enlarge). Some of these hobbies imply reading, like history, paleontology, paleoanthropology, Mesoamerican cultures… Or Astronomy. I own small telescope, a Meade ETX-125, and every now and then I take it out to my front yard, which faces south, and stargaze. My moon pictures were all shot through it. A little less often I take all the gear and go outdoors, to the mountains. That’s where the seeing is decent and that’s where one day I stood tall on my feet, scared shitless, and drew my knife. Funny. Now I think of it, I am telling another story of me outdoors at night. I had not realized, because I just came to the same situation from a totally different direction. In fact, when I wrote of my walk in the dark the other day I did not remember the night I unsheathed my knife. Do not expect a dangerously exciting story now, because it is not, but for a moment, for an endless moment of about one second or less, I faced a life and death decision. I have a few friends, not too many because I am not such a social guy and have little interest on who married or cheated on whom, who bought this or that car, or makes this much or more. I do not care for gossip and since gossip is the main line of conversation everywhere, I stay pretty much away from it. However, my friends are not too few, either. You can always find compatible souls out there if you go to the trouble, and I have friends I value and keep. I can tell you I made four acquaintances I cherish between 2000 and now, and maybe this year made another one. These add to the friends of my youth, whom I still keep. And then, there are the friends I have made through the internet who, in some cherished cases, have come to knowing me better than many old ones. Unfortunately, none of my friends care for astronomy beyond coming to my front-yard once to take a peep at Saturn, so when I go to the mountains I go by myself. And, to be honest, I have not been up there since this story happened. It was January or February, I don’t remember. One of the coldest months here, and the day was just splendid. No wind, no clouds, winter’s deep blue sky from horizon to horizon. You know those winter days when the atmosphere disappears and you can see far in the distance with amazing clarity. The nights of those days are the best for stargazing. I prepared my kit, left it out in the shade so it would cool to outdoors temperature, assembled all my gear and after supper, four hours after the sun had set, I took it all up to my car and drove out. Our mountains are old and rounded for the most part. We have those cocky rock youngsters and the Pyrenees nearby, but ours are mainly venerable old and bent grandfathers we visit with a sense of love, not of adventure. So I drove to a place human youngsters visit in the warm months with other thoughts in mind and parked where the path ended. From there I took my gear some 100 m further, away from the main road, to shield myself from the lights of any car that might pass by, and set camp. Three different phases of the moon, bigger one in the middle (click to enlarge). A telescope needs to be set properly, then it needs to cool down and you need your sight to grow accustomed to the deep darkness you are seeking. Takes a while and it is cold, but it is always worth the effort beyond words can explain. Not that what you see is particularly spectacular in this world where Hubble images are commonplace and seldom raise eyebrows, but what you are seeing is actually there, at the other side of your telescope. And then there is the magic of seeing. Not many people know this and less have experienced it, but when you look at some dim object through a telescope, the first glance is usually anti-climatic. You set your telescope, aim it at, say, Andromeda Galaxy, the closest we can see from here and therefore the biggest, and all you see is a soft whisper of a cloud, a weak whitening at the center of the surrounding blackness. A small diffuse hint of light in your eyepiece. However, if you stay and keep looking, the magic happens. Your brain gathers the little shreds of light info that are coming through your eye and begins to form another picture. That is the rational way to explain it, the true sensation is that, as you stay and keep on looking, the galaxy unveils itself to you. The small pale diffuse glow turns out to be the center of something bigger, and soon enough you see the galaxy is not big, but huge, and your eyepiece does not even let you see it whole. Deep space does not show itself if you just take a look. You need to be patient and keep on staring. You need to want to see it. And the result is just short of Epiphanic. Andromeda Galaxy Enhanced (click to enlarge). Original image by NASA/JPL-Caltech, further image enhancements and post processing by Weston Westmoreland. As you can understand, while you are at this, capturing one object after another, following the Messier List and wondering in awe at the beauty, distance, size and age of the things you are seeing, you are oblivious of anything that surrounds you. It was then that this guys came at me running from the mountains. This is not easy to explain as it took place in a matter of a few seconds. Maybe just one. Maybe less. One moment I was totally immersed in this space odyssey, and the next I was under attack. I could suddenly hear them running towards me, five, seven, ten people, I could not tell how many, and I could not see them. The sensation was they had slowly closed up on me and then had started to run, all at a time. My mind tried to make sense of it and all I could think of was of nomads, these people who move from town to town, country to country, scratching a life from where they can, in vans they park in hidden places to spend the night around the fire and then move on. They must have been camping deeper in the mountains and considered me to be an easy pick. I looked towards them, then towards my car, and realized I was not going to make it running. So I turned to face them. Do not get me wrong, I am as much of a coward as I need to be. I would have felt no shame whatsoever if I had run to my car and flown away, leaving the telescope and all the rest behind, but with my skin in one piece. In the split second it took me to raise my head from the telescope, identify the risk and asses my chances, I knew running was not an option. So I prepared to fight. Now, I was not going to just let them have me and do as they may. I know I am a fearsome thing to find in the mountains too. 6 feet two, 187 pounds, black mountain boots, black pants, black ski jacket, dark gloves, black balaclava. It is cold out there and I do not want to reflect light, so I look like a goddamn ninja. And then I carry my Aitor Jungle King II survival knife sheathed on my back. Not that I had ever thought I might need it, but as Clarence Worley says in True Romance, better to have it and not need it than to need it and not have it. Up to that day it had just been for my peace of mind. So I turned towards them, stood with my feet apart, unsheathed my survival knife and stretched my arm sideways and down. I turned my head-torch on to red light, so I could see them, and so they could see I was not running and that I was armed and ready. There was no time for fear, just for decisions. I won’t say I was not nervous, or the opposite, because there was no room for these sensations. Once I had made my decision, I was just totally ready and committed to what I had to do, and there was just nothing else. If anything, there was a terrible sadness because I knew my chances were scarce, but it was way underneath. The reptile part had taken command and the reptile is fearless and remorseless. The moment I turned the head-torch on I saw some scattered couples of red dots. My mind translated them instantly. Tapetum. Humans do not have reflective eyes, animals do. Animals! I immediately thought about horns, but I was already sheathing my knife and the sense of threat was already vanishing as quickly as it had overwhelmed me. They were just horses, four or five. They came to a few yards from where I was and stopped. I laughed. Once. It was to be life. With the relief, the reptile mind sunk back into the depths of my brain and, as I took over again, there came awareness. Awareness of my heart beating unreined, awareness of the fear I had felt, the terror, the desperate rage and sadness of expecting my life to be taken from me so unfairly, so soon. I was out of breath and felt cold. Slowly, dazed, I packed everything, the joy of the night taken away forever, and left. It is almost funny now, in fact, when I talk about that night I always tell it as a funny anecdote, but I can perfectly remember those 2, 3 seconds, maybe less, when I thought I was a dead man and decided to die fighting. Have not gone back alone with my telescope since. There is a little of everything here today. The shot of the painting on leather is just a straightforward shot, with some post-processing and a little Lomo effect. 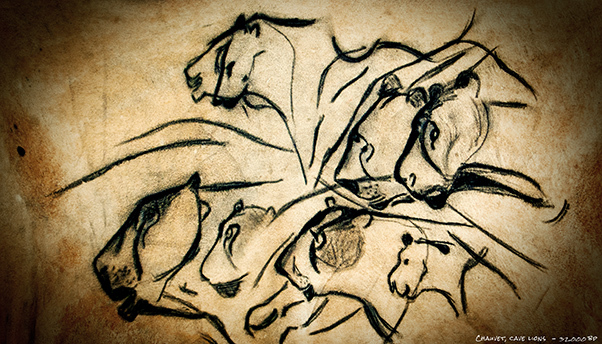 You can find more of my cave painting images in my Prehistoric Gallery. The amazing Death’s Head Hawk Moth is an HDR, so I could show the detail in both shadows and highlights of this incredible creature. The moons are long exposure shoots made with my usual camera through my telescope. I have shot many in many different Moon phases, but the result also depends on the stability of the atmosphere, so getting good results is tricky at least. The Amazing image of Andromeda Galaxy was legally taken from the NASA JPL photojournal and further enhanced. You can see more moons and NASA pictures in my Moon and Space Gallery. What an engaging story, Weston. The perceived threat was real to you and your strength of character came out.